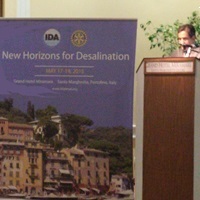 PSIPW was the platinum sponsor for New Horizons for Desalination, which was organized by the International Desalination Association (IDA) in Santa Margherita, Portofino, Italy from 17-19 May 2015. The conference was closely aligned with PSIPW’s vision of scientific innovation serving humanity’s water needs. Its agenda focused primarily on new horizons for the development of desalination and water treatment technology that will enable the development and implementation of renewable desalination and the pursuit of more sustainable options. Many past winners of the Alternative Water Resources Prize were recognised for work with direct relevance for desalination.